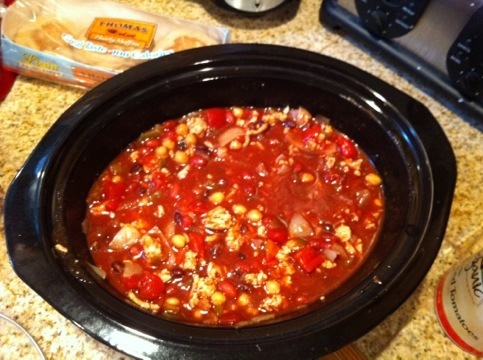 ← Danielle’s Featured Meal o’ the Day! Hi guys! I know it’s been awhile, and I know I said I hoped to write more around here but I’ve gotta say, NOT focusing on every little thing about my weight has been so liberating lately. No, I don’t mean that I’m eating crap food again… in fact, I’ve been doing really well just eating healthier in general. But I mean not writing about it, not thinking about it 24/7, not having to weigh myself every week. I swear the stress of that alone was actually starting to take a toll on my weight loss. Who knows, I might be totally wrong and will weigh myself (doing it the day before Thanksgiving, which is around a month from the last time I weighed myself) and have gained weight, but I have faith. I know I’ve at least lost some inches because certain clothing items are fitting even better than before, so that’s good! It’s just been nice to not constantly be thinking about it. Other things have taken up my time, namely planning out people’s Christmas gifts and also planning for our trip to Disney World. We’re almost a few days away from being 2 months out from our trip. It’s weird because over 2 months ago, we called to book our resort. Can’t believe how time flies, seriously! Anyway, the main point of today’s post is a new RECIPE! Yup, hell has frozen over, I’ve actually got a new recipe for you guys! 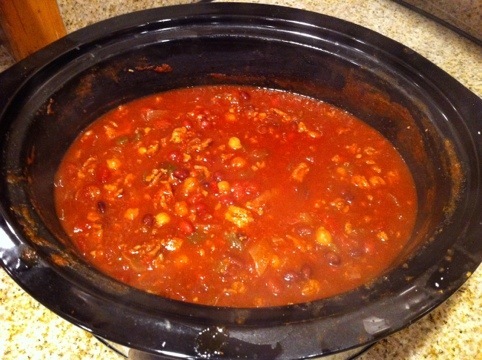 Being that it is totally the season for crock pot recipes, it only makes sense to kick things off with a super hearty turkey chili recipe. It’s really easy to make, like, beyond easy, and tastes AMAZING. Probably one of my favorite recipes to date. I should start by saying I found this recipe on my new favorite website for recipes, skinnytaste.com. I love this site because it’s got real recipes with real ingredients and doesn’t contain tons of really weird/fake products in the recipes. It’s amazing and I highly suggest you check it out if you’re ever looking for a great recipe for, well, anything! Now, while I enjoy following a recipe, I also enjoy sometimes spicing things up and adding in my own ingredients. This recipe was no different, as I ended up adding different things to make it taste how Matt and I would both want it to. Thing is, I couldn’t tell you EXACT measurements on the extras that we added, as we kept adding more until we felt it tasted perfect. Just a little warning before I give you this super easy and delicious recipe that will last you for days! These are for garnish from skinnytaste. I didn’t use these, but I garnished it will FF shredded cheddar cheese and a tbsp of light sour cream. Feel free to do whatever you want! 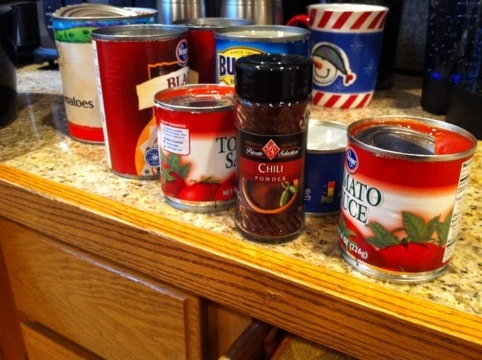 Steps to makin’ a crazy awesome chili! 1. 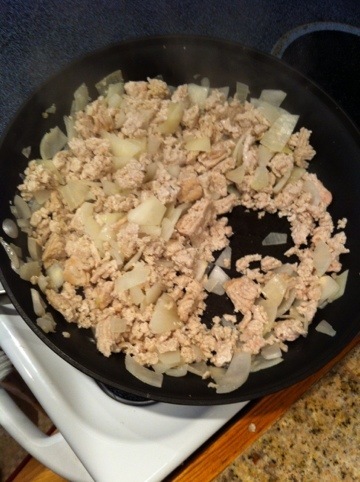 Brown turkey and onion in a medium skillet over medium high heat until cooked through. – You brown the turkey so it’s obviously broken up into tiny little bits and pieces vs. one huge hung of turkey, haha. 2. 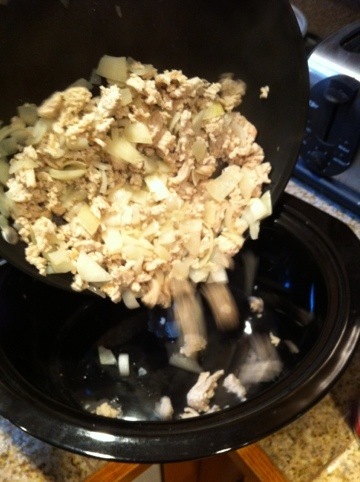 Drain any fat remaining and transfer to crock pot. Add the beans, chilies, chickpeas tomatoes, tomato sauce and chili powder mixing well. 3. Cook on high 6-8 hours. – The site says high for that long, but I did high and then low for the last 2 hours. 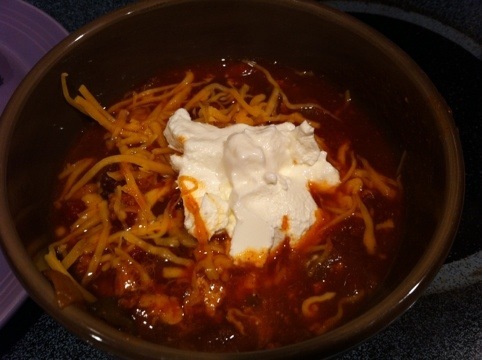 Voila, you have amazing chili. Seriously, it IS that easy. What I did was after a bit of cooking, I tasted it to see how the flavors were. At that point, I felt it needed more kick and flavor, so I just added my “extra” ingredients and kept tasting it until I felt like it was perfect. My other favorite part of this recipe? The ingredients are crazy cheap! The expensive part is the 99% FF turkey, which I’ve been grabbing at Target for like $4.50 (it’s normally 7.50-$8 at QFC! UGH!).. But even then, you’re managing to make enough food for multiple nights of eating, so you are saving some serious cash and are getting to eat well! AND the flavor only gets better the next day. If you couldn’t already tell, I’m pretty excited for leftover chili for dinner tonight!